Andys first band was the The Rasjaks. The name was created after a suggestion, from his father Harry Scott, to find an anagram using the initials of each band member. The band played just 3 gigs! The first was at St Peter’s Hall, Smithfield Road, Hightown, Wrexham in November 1963. This venue is now called “Caia Park Community Rooms” and a youth club still meets there every Friday just as it did in 1963. Apart from appearing in the Gang Shows with the Scouts, this was his stage debut. 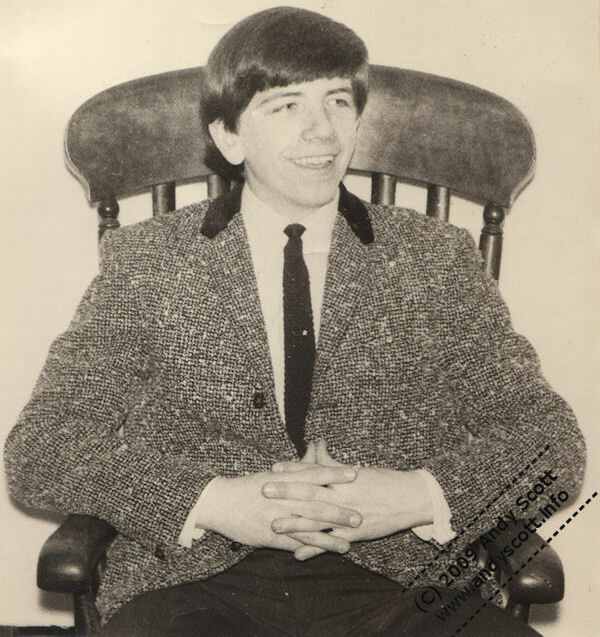 The second gig was at the British Celanese club, Maesydre, Wrexham, on December 31st 1963. It was New Years Eve and they had equipment problems, which embarrassingly left them without vocals for most of the evening. The “instrumental” repertoire only ran to 4 or 5 tunes so they decided to play them again and again. As they launched into them for the third time someone in the audience shouted out that he quite liked them the first time round, found them mildly irritating second time and begged not to play them again! The final gig was supporting a band called ‘Guitars Incorporated’ at St. Margaret’s Church Hall, Chester Road, Garden Village/Acton, Wrexham during January 1964. Unfortunately the Drummer – Dave Kirkham went ‘AWOL’ the day before the 3rd gig and the writing was on the wall. Guitars incorporated were having some ‘player problems’ and both Murray and Andy knew at least one of the band members from School, Grove Park Grammar, and they therefore decided to join the band. They played in local pubs, community centres, Fareways coffee bar and the Memorial Hall in Wrexham. They played their most prestigious gig at The Royal Lido, Prestatyn. Guitars Incorporated lasted until September 1964 at which point Jim Humphries and Andy teamed up with Dave Kirkham (again) and formed The 3-D’s (the Liverpool band The Big 3 were our idols at the time). Murray Robinson also left Guitars Incorporated at the same time but was grounded by his parents for a while because he was starting to fall behind with his school work. The 3-D’s mainly played a weekly show at the Acton Community centre, although their very first gig was at The Swan, Pen-y-bryn, Wrexham. Other venues they played at were the Memorial Hall, The Royal Lido, Prestatyn, Llangollen Youth Club, Froncysylte Youth Club, The Pier New Brighton (a Competition) The Working mens Club in Leasowe (The Wirral). All the gigs were in 1964. This line-up lasted a couple of months until Andy left to join The Forewinds. At this time, according to Murray, Andy had become known as one of the best bass players in the area plus he could also play guitar. He was often called by other bands to stand in for missing members due to holiday or sickness. He was trying to find his ‘niche’ in the music business and found himself moving from band to band. This included The Saints, The Forewinds, The Missing links and The Strangers who won a battle of the bands competition at Trentham Gardens, Stoke On Trent. He even played a one off gig with Clive Williams and Ian Davis (later both in the Silverstone Set) with the Vocalist, Glyn of the Strangers. This came about after the Strangers had a bust-up backstage and they were all in the audience and got up to play as a scratch band! Whilst Andy was playing with various bands, his friend Murray Robinson had now joined The Silverstone Set and by the summer of 1966 the bass guitarist position had become available. Murray suggested that Andy would be a good replacement. He made his very first television appearance not long after joining the group. They appeared on a T.W.W programme called “Popportunity Now” and at the audition for the show they played “The In Crowd” By Dobie Gray. They passed the audition and were selected to perform “live” on the show, which was transmitted on 26th July 1966. They performed “Turn On Your Love Light” originally by Bobby Bland. This lead them to appearing on a TV show called “Herd On The Scene” with Hermans Hermits after which the late Derek ‘Lek’ Leckenby (Hermits Guitarist) liked what he had heard and became their Record Producer. He had found a song called “Worshipping the Ground You Walk On” and arranged a recording session at De Lane Lea Studios in London [later to become Kingsway Recorders where the Sweet recorded “Fox on the Run”]. The normal practice back then was to use seasoned session musicians and what a line up of players! Drums – Clem Cattini [most hits of the 60s including Telstar], Bass – John Paul Jones [later with Led Zeppelin], Hammond Organ – Brian Auger [Wheels on Fire with Julie Driscoll] and the Blue Flames as the brass section. Sadly nothing ever came of the sessions and The Silverstones never released any records. They also passed the audition for Opportunity Knocks (at the audition Ted sang and played drums which the producer liked hence that is how they performed on the show). Opportunity Knocks was the most popular TV talent show of its time, hosted by Hughie Green, they made our first appearance on 12th November 1966. The TV viewers must have liked the band because they were winners 5 weeks in a row and made their final and sixth appearance on the Christmas all winners’ show, which was won by Freddie Starr. To keep pace with the times they decided to shorten the name of the band to The Silverstones. “Hey Joe” had just been released and they fortuitously found themselves supporting Jimi Hendrix, at the New Century Hall in Manchester on Saturday 7th January 1967. Ted and Andy were totally blown away by the new sound we had heard and decided we needed to change direction musically. Other members of The Silverstones were not so keen so the band sadly but inevitably split up. The band found ourselves with a dilemma. They had a band, The Silverstones, who were filling venues, mainly in the north of England and a popularity growing with every show but Ted and Andy wanted to expand both musically and regionally. There were three drummers during the cross-over, Clive Williams, Richie Winn and Pete Tracy. They auditioned at EMI for Tom Springfield and John Burgess, nothing came from this, however after an introduction from their friend, Andy Fairweather-Low, they duly signed with Decca under the watchful eye of producer, Noel Walker. The new sound that Ted and Andy had strived for was achieved when drummer Sean Jenkins joined. His band,The Shake-Down Sound [later to become Mott the Hoople!] were going through changes and he jumped ship, so there they were – a new band with no name just “new” ideas. The agent, Danny Betesh of Kennedy Street, was a bit taken aback but agreed to judge them on performance. They were booked to play a private function and thankfully all went well. Danny called them to a meeting where their future was discussed and somehow when they left they were now called The Elastic Band! The name was meant to represent the fact that between us they could play a multitude of instruments and musically it had no boundaries. This line up only lasted for 3-4 months Tony left and was replaced by Andys brother Mike Scott. Just like Tony he also played bass and saxophone. Having been on the same bill as The Love Affair numerous times in 1969, they became increasingly aware that they would be watching their set with more than just a passing glance. It soon became clear that they were interested in the singer, Ted, and in December 1969 they offered him the job, after Steve Ellis’s departure, and he took it though it must have been a difficult decision. This was a bombshell. The band had recorded the album “Expansions on Life” and were awaiting its release. With so much to look forward to, they now had nothing. Andy still believes that if they had stuck together The Elastic Band would have broken through but now we will never know. At the same time Sean Jenkins left to join Mayfields Mule. Mike and Andy found themselves with commitments and no band but in true Scott form they set about the task the only way we knew – with true grit! Andy always believed that something will show up and as usual it did – they met a great guy John Megginson and he introduced them to a “McCartney”! The band are now backing musicians for Scaffold. Andy and his brother moved to London and briefly linked up again with Sean Jenkins in Mayfields Mule. Whilst in London Andy went for 2 auditions on the same day. The first was the Alan Bown Set, because Robert Palmer had just left, and the other was The Sweet and he was only 19 by that time and was offered the job to replace Mick Stewart. And the rest is history ….